The 2019 ION Traze protectors have arrived and are now available from us! The extra flexible K-Traze knee protector comes in two versions, the cheaper sleeve version and the AMP zip version with side zipper. The Traze series is ideally suited for enduro use! Protectors for mountain bikers are technically far developed products, which help to avoid or prevent severe injuries. Protective clothing is a familiar sight in bike parks, at dirt jumping or at downhill and enduro races. In particular knee, shin, elbow, and back and/or the spine should be well protected when it goes into the thick of things, when it becomes fast or goes high up into the air. The comfort of MTB protective clothing has increased in the last years and has resulted in the gear no longer disturbing the biker when stepping on the pedal or even grazing the skin. Even bikers with a very good riding technique cannot avoid falls. The trail and nature always are good for a surprise and sometimes can bring even the best mountain biker down to earth involuntarily. With the correct bike protectors, the worst can be prevented in most of the cases, except for some minor abrasions. Whoever foolhardily goes down the mountain without any protectors, risks typical biker injuries of the knee, elbows, hip or forearms. 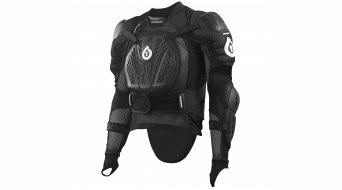 In our protector shop, you will find all protector jackets & vests or even -shirts, protector trousers or even knee protectors (knee guard) and elbow protectors (elbow guard). Benefit from our large selection of brands: Poc, IXS, Dainese, 661, Alpinestars and Co. at favourable prices.